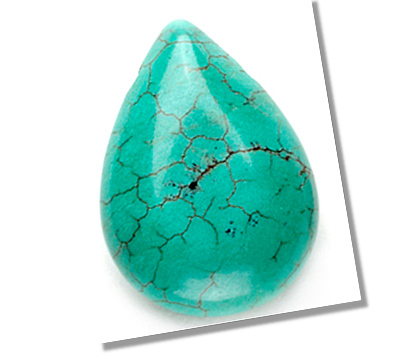 Turquoise is the birthstone for December and is ranked highest among the opaque stones. This stone is one of the first gems to be used in jewelry. Its name is derived from the Greek word "Turkois" which means "Turkish". It’s called so because it was first brought from Turkey. It is the official state gem of Arizona, USA. This gem is highly-prized throughout Asia and Africa, not only for its particular hue of blue, but also for its prophylactic and therapeutic qualities. China is the major source of this beautiful gemstone. There are a few new mines in Iran today that do produce this gem. Other than these, this gemstone is mined in Tibet, Egypt, Chile and the southwestern United States. It is an opaque, light to dark blue or blue green stone. This is the only gemstone belonging to the phosphate family. It is a hydrous phosphate of aluminum with a small percentage of copper which gives it the blue coloring. When associated with iron the color tends to be greenish. 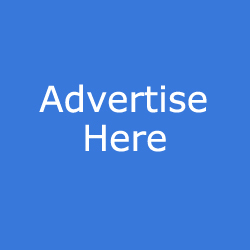 The finest color is an intense blue, with poorer qualities tending towards yellowish green. The famous Persian variety, which can be very intense and pleasing blue, is considered a very rare and valuable gem. Porosity, color, evenness of the color, texture and matrix (the mother rock) of natural gemstone are the main parameters that decide the value of this gemstone. Evenness of color throughout the stone plays more important part in deciding its value than the shade of color. A stone which is low in porosity and of fine texture (this also increases the durability of the gemstone) will fetch the highest prices. The price of this gem may vary from $4 per carat to $50 per carat depending on its size and quality. 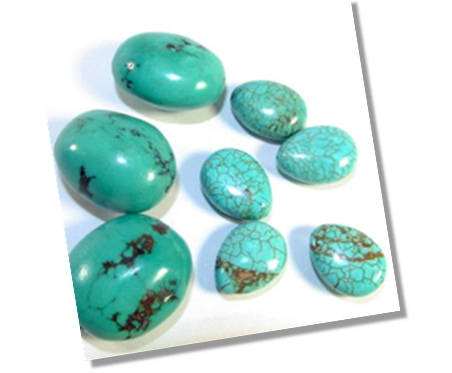 Treated turquoises are cheaper as compared to the natural untreated ones. This jewel was believed to protect the wearer from poison, reptile bites, eye diseases and the evil eye. It was also believed capable of warning impending death by changing color. There was a common belief that drinking of water in which this gemstone was dipped or washed could cure bladder ailments. Even today it is considered a symbol of courage, success and love. It has long been associated with American Indian Jewelry and Art. This gem is most often used for beads and is mainly cut and faceted in the dome-like cabochon cut for jewelry. 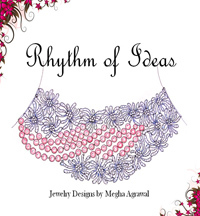 It is often custom cut into a round shape or an oval shape when used in inlay work, designer jewelry or in carvings. 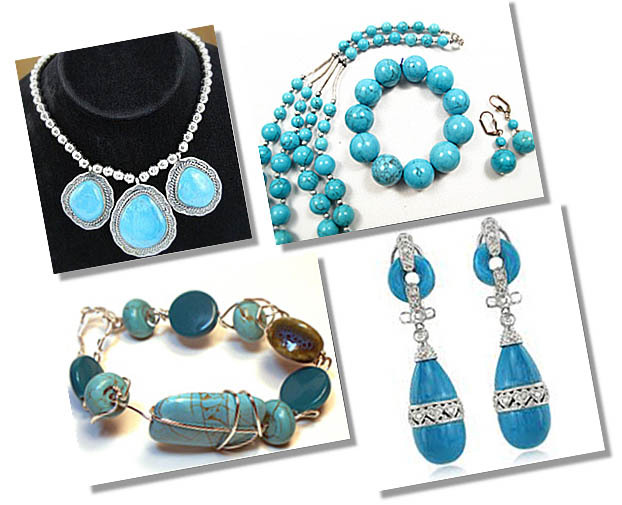 Turquoise bead necklaces, bracelets, earrings, necklaces and rings are always in trend. Exercise caution while buying this stone. This is a very frequently simulated gem. Very fine glass imitations are produced that are difficult to distinguish from the genuine. These imitations and reconstructed stones (made from turquoise powder bonded in plastic) have saturated the market place, as do synthetic varieties. Many treatments are carried out on this gemstone today. Hence, it is advisable to get it certified from a reputed laboratory before purchase. If in doubt, check it out and get a complete description on the bill of sale: 'genuine, natural turquoise'. This gemstone is susceptible to aging and may turn greenish or possibly darker with age. So, utmost care must be taken when wearing, both to avoid contact with soap, grease or other materials that might discolor it, and to protect it from abuse, since it scratches fairly easily (on Mohs Scale of hardness, it is rated 5 – 6). It is also easily impacted by heat, oil, sunlight, moisture, perspiration, dryness so this stone should not come in contact with strong perfumes, or chemicals. This is because, due to its porosity, it easily absorbs dirt, grease and smell for long period. For this reason, this gem is not recommended for the engagement ring.